For those of us that love ‘the good life’ we quickly learn to appreciate that often our love of plants has to either take a back seat or be evolved to accommodate our love of nature and animals! For me it was the latter, at the offer of having chickens I was never going to decline the opportunity of having true free range eggs each morning; however I would be wrong to claim that my plants haven’t suffered for it. 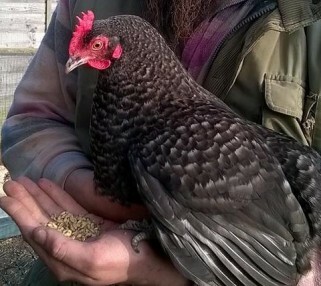 Initially I was foolish enough in the first few weeks to believe that my two hybrid hens would comfortably stay in the pen I enthusiastically built for them. How wrong could I be…….. 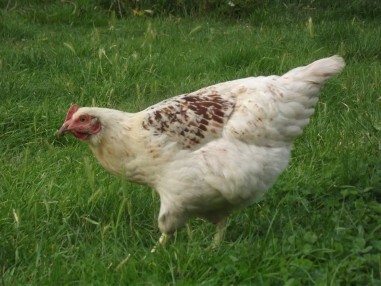 I was now the proud owner of a Houdini Hen & David Blanes chickeny cousin! 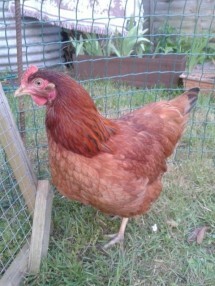 With clipped wings and a 5ft fence I still came home every evening to both girls dining upon my beetroot crop. Stage one of my defence against the great escape was to erect a willow hurdle hence around the Veg garden, with a ferociously uneven top that even I struggle to straddle. Which also included a brassica cage, several metres of fleece and an array of scented herbs to disguise the smell of cabbage! After this failed I began to start rethinking my plant choices rather my useless barriers. I discovered that the chickens rarely eat the plants, the damage is done at ground level where they dig for grubs and create craters for their dust baths. So quite often plants would be literally ‘scratched’ to death or the earth removed from the root ball so much that plants collapsed. So my efforts turned to planting established specimens rather than young plants, woody stems rather than soft foliage and often caging the plant until its rooted rather than trying to cage the chickens. This gives smaller plants the best chance to establish before being introduced to the birds. Obviously I have had to sacrifice my most delicate plants and replace them with robust specimens but some I have saved and put in pots on high benches. It is possible to own free range chickens in a small garden and still have wonderful ornamental plants and some vegetables. Like all gardening we have to adhere to the environmental scenarios given to us. Some of us struggle with dry sandy soil and others are paying penance and enduring heavy clay. I am lucky enough to have rich loam in my garden but my daily chicken challenges stop me being smug about it! I love my girls, and they do benefit my garden too – eating many of the unwanted pests such as snails, aphids and caterpillars – turning the top layer of soil for me and eating many weeds, chickweed being a top favourite and of course they also aerate my lawn each winter so when summer arrives in is lush and green. The daily eggs aren’t too bad either…………..